B U B B L E G A R M: Nail Polish Rolls.. Yes rolls! A new way to store my nail polishes. I stored my nail polish like THIS before which was working great apart from the fact that I couldn't see all of my nail polishes at a glance, and now I have rolls, 3 rolls from Roo. I was actually sent these for consideration for review, but as soon as I saw 'storage' in the sentence I had to try them out being the organisational freak that I am. The rolls are made from faux leather and come in a variety of colours. Each roll fits 14 nail polishes. If 14 is as far as your collection stretches then great, but I have much more. I decided to organise mine by colour. Storing them by brand would have been a good idea too, but I own too many different ones. 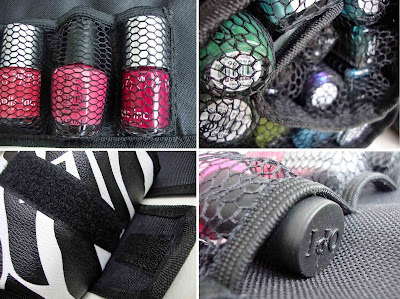 The compartments are made up of elastic and mesh. I fit every brand of nail polish apart from the chunky square Estee Lauder ones. The fastening for the roll is made from velcro making it quick and easy to use. The roll itself is durable and practical to use, I know that I will have these for a long time. The colours I picked were the black, pink and zebra print. Overall I love the practicality of these, if I want to paint my nails pink, I just grab the pink roll and I have all of my variations. I do wish there was a larger version though, that fit say 5 rows of 10 polishes, this way it would be magical in my opinion to see 50 different nail polishes all spread out without making a mess! :) I also wish it looked a bit prettier from the outside, maybe something floral... maybe I should do a DIY project, hmmm. However 1 roll that fits 14 is fantastic for travelling! The Roo rolls are available HERE for £14.99 each or any 3 for £30. 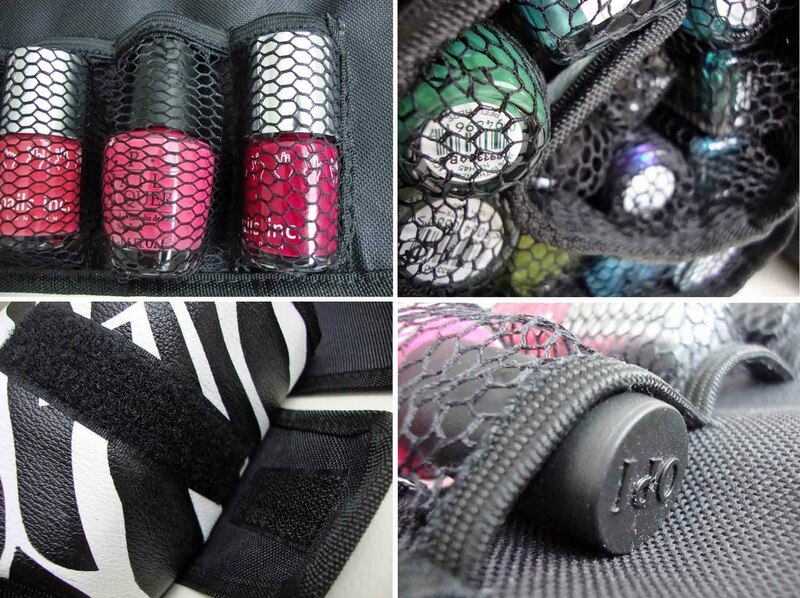 How do you like the 'Roll' idea for storing your nail polishes? Disclaimer: The rolls were sent for consideration for review, I was not paid to write this post and I am not affiliated with the brand. Honest opinion as always! nice blog:) invite me: *! FOLLOW? This is such a great idea, especially for travelling! They are so cute! I'm planning to buy these for my mobile nails business. I never carry more than 25 polish with me so a couple of these would be perfect. these are perfect for this! What a fab idea, mine are currently in a Nails Inc mini suitcase but I love the fact that you can see all the colours when they're in those rolls. thats interesting n the packaging is cute, but im concerned it takes up too much space when u have more than one... u can type in 60bottle or 90bottle acrylic storage for nail polishes which is what i use in the salon, alot more durable and stores more if ur a nail polish freak like me lol. Oh my goodness what a fantastic idea! I love it! Agree with ya hun on the design front, but other than that, think these are great & will deffo consider purchasing! I think thats a pretty awesome idea! Interesting...I've never seen a nail polish roll before. Thanks for sharing! that is pretty cool. my rack is getting pretty crowded so i may look for something like this. great idea! These look perfect, what a great idea! I'm not into nail polishes, but these are pretty awesome. I love the idea. So handy. Especially for travelling. At the moment my nail polishes are neatly stacked in coloured order on my shelf. That's a great idea but you're the right, the designs aren't the nicest. The black one is definitely the most appealing to me. I'm running out of space for my polishes so I might invest in one of these soon. Everyone should paint their nails. Add a bit of colour to your life, why not? Oooh! I love these rolls! I store all of my nail varnish in a big bulky tub under my bed so I never have them there to remind me to paint my nails! These nail varnish rolls are a great idea. I am going to recommend them to many people. Check out my look at Shellac nail varnish. It is a good storage solution, sweety!! I am not sure if I like it, though... I store them in a little shelf and they look good!! 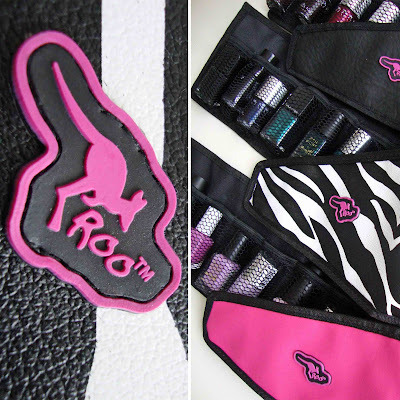 i love nailpolish, nice bags! Fantastic storage solution and can still see all of the shades. Thanks for the tip!